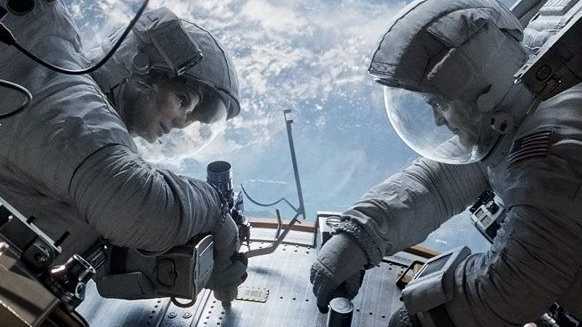 A DECADE after collaborating on Harry Potter And The Prisoner Of Azkaban (2003), Mexican director Alfonso Cuaron and British producer David Heyman have combined forces again on Gravity, a 3D survival thriller set in deepest, darkest space. The new film (which opens the Venice Film Festival) is a visual triumph even if its storytelling is less than sure-footed. George Clooney plays veteran astronaut Matt Kowalsky. Sandra Bullock is cast as Dr Ryan Stone, an engineer on her first assignment. As the film starts, they are on a routine shuttle mission. Showing off his spacewalking ability, Clooney's character is joshing away with the controllers back in Houston. Bullock is tinkering with the machinery. Debris from a Russian satellite is hurtling toward them, contact with Houston is lost and their chances of returning safely to earth recede rapidly. The opening scenes have a mesmerizing, abstract beauty. Cutting is kept to a minimum as we see the two astronauts floating in space in what seems like perpetual slow motion. Cuaron makes playful use of 3D, showing objects slipping out of their grasp and hovering in front of us. The brilliant cinematographer Emmanuel Lubezki, who also shot Terrence Malick's The Tree Of Life, delights in the opportunity to contrive the kind of galactic imagery we're more used to seeing in Carl Sagan documentaries about the cosmos than in Hollywood studio thrillers. The production design is meticulously detailed. Gravity was shot at Pinewood and Shepperton Studios and certainly won't do any damage to British technicians' continuing reputation for excellence. Clooney's constant wisecracking provides an earthy counterpoint to all the self-consciously sublime footage of space. Given that he is in his space suit and helmet in almost every shot in which he appears, it can't be said that we see a great deal of him. The impressive Bullock is more visible. Like Sigourney Weaver's Ripley in Alien, her character is tough and self-reliant and challenges the gender stereotyping still often found in action movies. Bullock, who reportedly only won the role when Angelina Jolie rejected it and Natalie Portman dropped out, clearly relishes a physically demanding and unglamorous role as far removed from the world of Miss Congeniality as can be imagined. The one problem with Gravity is that the plotting never quite matches its visual imagination. At times, as the astronauts desperately battle fire, tangled parachute strings and malfunctioning machinery, matters risk becoming just a little banal and predictable. Even so, this is a film that, at its best, really does induce a sense of wonder.